Do Roma need protection from themselves? In their letter to Secretary General Jagland the academic colleagues criticise the Council of Europe’s communication from 7 March 2016 in which it announced that it will dedicate 20 million Euros to “awareness raising activities at a local level to help curb early or forced marriages, domestic violence, trafficking and forced begging in Roma communities by addressing negative consequences of such activities.” They write that this statement puts the blame for the effects of marginalisation on the Roma themselves, and request a correction from the Council of Europe clarifying that the causes of exploitation and victimisation are universal and not inherently linked to Romani society or culture, and that they should therefore be addressed globally rather than with specific reference to Roma. Yet despite these reservations, the protest letter, addressed to what is widely regarded as one of Europe’s highest moral authorities on human rights, received wide support. Members pointed out that domestic violence is widespread in poor communities, who are also the most frequent victims of trafficking and forced begging, while early marriage is usually linked to the opportunities that young women have to access training and education or to find paid work outside the home. Framing the issue as a cultural one creates a license to segregate Roma and to contain them. It also promotes the view that inclusion should inherently be linked to the adoption of particular norms of behaviour rather than dedicated to the elimination of exclusionary practices and barriers. Contributors also drew attention to a gradual build up of a focus on trafficking and early marriage in the deliberations of the Council of Europe’s Ad Hoc Expert Committee on Roma (CAHROM). The issue figured prominently at the latest CAHROM meeting in Bucharest on 2 March 2016, just days before the new Thematic Action Plan was announced. It was also on the table at the CAHROM meeting in May 2015 in Strasbourg. 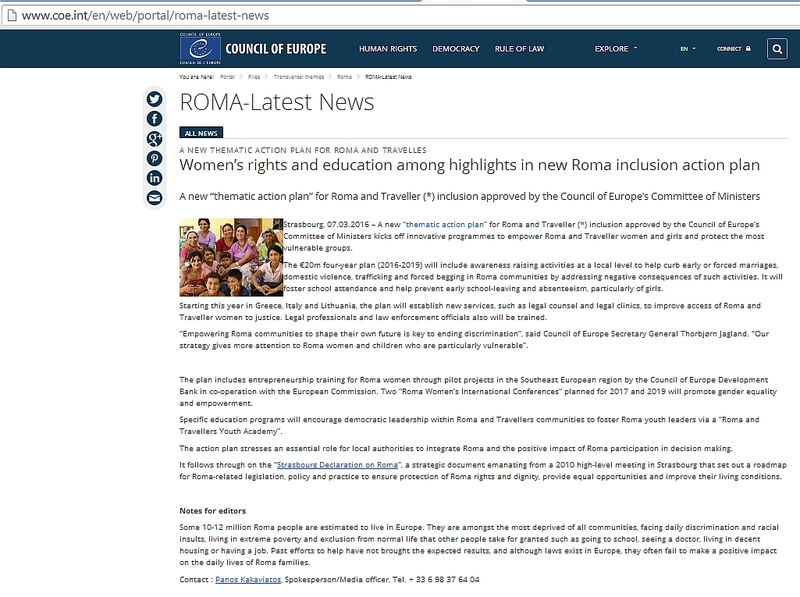 Indeed, ‘trafficking and early marriage’ have been high on the Council of Europe’s Roma agenda since its Strasbourg Declaration of 2010, when the organisation began to shift its attention away from Roma political participation and toward a focus on ‘mediation’ projects, legitimised by the view that Roma show a propensity, supposedly, to voluntary disengagement from mainstream institutions and mainstream behaviour norms (see my recent article on ‘Europe’s neo-traditional Roma policy’). But even as a tactical tool, intended to tempt sceptical governments to support the Council of Europe’s Roma inclusion agenda in its entirety, the announcement would seem highly inappropriate: Using exclusionary discourse to promote inclusionary policies can easily backfire, and there is a real risk that the approach will exonerate national governments that do not have the political will to implement Roma integration policies, and that it might legitimise the positions of anti-Roma political parties. Interesting lessons can be learnt from the Network’s discussion and its outcome. The first is the encouraging realisation that an advocacy initiative can resonate well with academic colleagues without constraining the pluralistic character of the debate or curtailing participants’ confidence to discuss conflicting points of view openly, in a way that allows them to benefit from and capitalise on the range of insights, arguments and pieces of evidence. The fact that academic circles show a commitment to public engagement and advocacy on issues that surround public images of Roma also debunks the myth that academia is the “last stronghold of colonial, paternalist approaches to Roma”, expressed by some recent commentators writing in support of another recent Council of Europe initiative, the European Roma Institute. Indeed, while academics have taken a lead role in this particular debate, standing up against the wholesale portrayal of Roma as beggars and rapists, there has been deafening silence among the ranks of the more established Romani activist circles. This is not surprising, given the fact that Roma activists are in many cases direct beneficiaries of EU and Council of Europe funds and therefore have less freedom than academic colleagues to direct open criticism against influential European policy bodies. The European Academic Network on Romani Studies is finding itself in a different position. Having been set up initially by the Council of Europe itself, it was criticised by some activists for failing to allocate a fixed representation on its elected Scientific Committee for people who self-identify as Roma. Now it has matured into a body of members who are able to engage in an organic process of open and pluralistic debate without fear of either internal splits or external repercussions. The Council of Europe’s response to the criticism may well prove to be an indicator of how this organisation sees its future strategy of engagement with Roma – perhaps more so than its own controlled proclamations. It can choose to take the easy way out by blaming the statement on a non-fit-for-purpose communications officer who failed to consult the Private Office before going public. That would make the Council of Europe look clumsy and unprofessional. It would also mean that the next communications fiasco is just waiting to happen. Another option is to dismiss the criticism and repeat the line of the Secretary General, who is personally quoted as saying: “Our strategy gives more attention to Roma women and children who are particularly vulnerable”. That would risk appearing complacent and insensitive to the criticism that contends that the causes of the problems lie beyond cultural traditions. If, on the other hand, the Council of Europe chose to take the criticism on board, invite experts to an open discussion on the proper way to address the symptoms of poverty and exclusion, and issue an unequivocal clarification that it does not seek to blame the Roma for their own misery or to legitimise the patronising obsession to contain and control their behaviour, then it might not only re-gain the respect of its critics, but also be in a position to tackle head on the very core of anti-Gypsy sentiment: the perception that fundamental differences in family values, kinship organisation, and sexuality constitute the major cultural fault line that separates the majority from the Romani minority. Yaron Matras is Professor of Linguistics at the University of Manchester. He is one of the founding members of the European Academic Network on Romani Studies, Coordinator of the MigRom research consortium, and author of ‘I met lucky people: The story of the Romani Gypsies’ (Penguin Press, 2014). I am glad that supporters of the ERI have shared their thoughts and developed the debate. Many people want change and the ERI is a new initiative. But hopes and wishful thinking are insufficient and there must be a role for critical analysis. I expect that many people who support the ERI do so because of its noble aspirations to fight prejudice and discrimination and want to believe that the ERI can deliver. The goal is so vast that it is not a question if the ERI can eliminate prejudice and create a ‘positive’ Roma image, but whether it makes a useful contribution. Therefore, we need to consider whether there any reasons to think that the ERI would do more harm than good. In my view this is an important debate, not because of how a small organisation might directly affect the few individuals and organisations who have any interest in it, but because of what it represents at a time of emerging Roma politics. Roma has become a political object (identity) and this will remain the case and have a profound impact on many countries and across Europe in the years and decades ahead. A key feature of this politics is the participation of Roma people in public debate – Roma activism. Despite being the far weaker partner in the relationship with mainstream institutions – states, NGOs, international organisations – the political ideas and actions of Roma activists are important in how the politics of Roma plays out. I appreciate that Roma activists need to explore every opportunity – and the ERI is precisely that, the provision of resources and status by OSF and the Council of Europe– but judgement is required as being easily led is likely to result in strategic mistakes with tragic consequences. One area of concern is the thinking underpinning the ERI and what this implies for the quality and motivation of its work in its complex and serious subject area. In all three proposal or consultation papers (May 2014, October 2014, May 2015), the ERI has been justified as a crucial means for tackling the newly discovered Roma problem of ‘low self-esteem’ (it is defined as a problem and is explicitly attributed to Roma). Zeljko Jovanovic (8 May 2015) has elaborated on this concept explaining that ‘antigypsyism is not only in the non-Roma mindset, but in the Roma mindset too ‘. Putting to one side how meaningful it can be to apply what definitively relates to individuals to a diffuse and vaguely defined population of millions, it is clear that low self-esteem is a disadvantage that lies within Roma people. As the December paper discussed, this is a serious problem because ‘Improve[d] Roma self-perception [is] a prerequisite for empowerment and participation’ and ‘genuine participation of Europeans of Roma origin “is a precondition for success”’ in ending the ‘widespread economic and social marginalisation of Roma communities in Europe’. The ERI is being called into being to tackle this fundamental problem and to institutionalise the belief that people considered Roma can’t expect better treatment from states and societies until they show a bit more self-respect! This train of thought is less an example of clumsy drafting than illustrative of the value of a critical analysis which points to how politicisation (and bureaucratisation) also pathologicalises Roma identity with the aim of managing (maintaining), rather than overcoming objective problems of poverty and exclusion. Another example is the unambiguous claim that social inclusion initiatives have proved ineffectual because they have not tackled the ‘root causes that stand in the way of meaningful progress: ignorance, hatred and mistrust’. This is, to say the least, a great simplification of a complex issue. What makes people think and feel the way they do? Aren’t ‘ignorance, hatred and mistrust’ more likely to be symptomatic of social and economic relations than their ‘root cause’? This oddly restrictive approach to understanding very real issues regarding experiences and perceptions of Roma identity and people is less an intellectual proposition than an ideological one. In making the ‘root causes’ of poverty, exclusion and discrimination (as well as of multimillion euro policy failure) matters of the mind, no consideration need be given to the structural and systemic factors that many of us believe play an important role in how Roma is understood. The system is fine, just the people that are wrong. They think wrong thoughts about Roma. Furthermore, it is suggested that these wrong thoughts are essentially a legacy from the past (rather than generated within contemporary society). What is required is re-education or at least some good PR – the promotion of a ‘positive image’. This neo-liberal ideology may be the answer, but there is no reason to think so. More than two decades of promoting Roma difference while failing to overcome the social and economic inequalities created at transition have not obviously improved the safety or social standing of those labelled Roma. The debate about the ERI has included concerns from academics that it would undermine the reputation of scholarly-level research. In respect of the ERI’s own work, how that is assessed will depend on who is judging. In the ERI’s case there are likely to be many different audiences, yet surely among the most important would be the ERI’s financial and political sponsors. The way the ERI has been presented to date indicates that the ERI is likely to retard the development of more sophisticated critiques and effective interventions to combat anti-Roma racism. Rather than at the European level, it would be better to invest in national networks for studying the reasons for and challenging prejudice and discrimination in the states and societies where Roma people live. While its ideology may lead to the ERI having a harmful impact on the theory and practice of the fight against hostility towards Roma, it could more prosaically damage perceptions of Roma by failing as an organisation. Corruption and dishonesty, notably through the misuse of monies is not unknown and has damaged the reputation of Roma activists and activism. There is no reason to believe that the ERI will be corrupt, but it has some common risk factors such as dependence on limited sources of external funding and ambiguity of method and mission. More broadly, the ERI maintains a basic weakness of many Roma organisations in lack of accountability to those in whose name it acts. Factionalism is another way in which the ERI could contribute to a negative perception of Roma political claims. Donor dependence and absence of popular support make Roma organisations easy to manipulate so that they serve the interests of their masters more than Roma people. One has to admire the brass neck of those who claim the ERI is some watershed in Roma control, when not only are there already many organisations run by Roma people, but also because this is so obviously not the case for the ERI, which will be entirely dependent on meeting the expectations of its sponsors. The proposed ERI appears to conform to rather than challenge the long historical tradition of imposing compliant Roma leaders on communities to maintain the status quo. Another area of concern is the ERI’s contribution to nationalism. This is a difficult issue as so much of Roma politics is rooted in the idea of bringing Roma together in one politically recognisable entity, a political community regardless of how loosely integrated. With its mission to showcase Roma culture and create a positive public image for Roma, the ERI will inevitably have to confront the question of who and what is or isn’t Roma. Of course, the ERI would not have a monopoly on these matters, though its distinguished status derived from its relationship with the Council of Europe would affect its influence. Yet, this status links it to a particular conception of Roma, an explicitly political conception that most vaguely and inclusively defines Roma, which has been most influentially promoted by the Council of Europe (as it provides unique governance opportunities). The political role of the ERI is underlined by its policy analysis and advice role and though one would expect that the ERI would defend its main sponsor’s vision of who the Roma are, so it is worth considering whether the construction of an administratively convenient EuRoma nation is really a good idea and even harmful to Roma people? Nationalism has both progressive and regressive characteristics and the claim that people deemed to be Roma belong to their own political community has different significance across Europe. In some countries there is widespread dislike of ‘the Roma’ and regular politicised hostility, not only from the far right. The institutionalisation of the EuRoma nation would not necessarily empower Roma people in their national and local struggles, but would certainly provide an ideological legitimacy to their exclusion. As well as providing the cultural narrative to the EuRoma nation, the ERI would also contribute to exclusion through the creation of Roma political institutions. Admittedly, the Council of Europe has sponsored the ERTF since 2004, and its coincidental spurning of the aspirationally democratic ERTF for the unashamedly elitist ERI tells its own story. The issue with the ERI is also timing. Since 2011 the EU has sought to clarify the relationship between the European and national level by emphasising the responsibility of Member States for the treatment of their Roma citizens. The role of European intuitions is to facilitate and support, but not to deliver or take responsibility. There are many faults with the EU Roma Framework, but its fundamental idea of focusing on national action and accountability is profoundly important. Yet the ERI directly contradicts this principle, institutionalising European level Roma governance. I am not so much concerned with the specific impact of the ERI itself, but that it sets a precedent for the proliferation of European Roma intuitions into the future. I appreciate that many people have high hopes of European influence on domestic Roma institutions, but I believe that European Roma governance will not work, indeed that it can be understood as a displacement activity. The EU has recognised that all the changes that need to occur to improve the lives and opportunities of Roma people have to take place within national states and societies, be initiated, undertaken, legislated for or regulated by domestic authorities and socially and culturally embedded in the communities in which Roma people live. Anything at the European level can only be a means to the end of national reform. European Roma governance misdirects attention (Roma activism) to where power isn’t and away from where it should be focussed. The most fundamental risk inherent in the whole politicisation of Roma identity is that raising the political profile of Roma without effectively addressing the associated social problems leads to increased hostility towards Roma people and identity. Unfortunately there is a tendency towards this as it is much easier and cheaper to integrate Roma identity into public discourse than to drive through economic and institutional reform. It is worth considering why the Council of Europe’s Secretariat is so keen to create a separate Roma institution on behalf of a body that is led by minsters from national governments and overseen by parliamentarians of national legislatures i.e. precisely those who have the political power and means to advocate for and implement domestic reforms, but who seem to be conspicuously unable to achieve much progress when it comes to improving the living standards and life chances of so many of the people they label as Roma. As currently proposed the ERI would be an elitist neoliberal institution that further promotes a convenient symbolic politics at the expense of one based on realising the rights Roma people already have as citizens. The alarming proliferation of ‘campi nomadi’ (nomad camps) in Italy intensifies the urgency of analysing their internal mechanism and the complex relation between all the parties ; ‘camp dwellers’, government agencies and Civil Society organisations [CSOs], involved in their production and reification. To arrive at an adequate appreciation of this nexus, the three components of what has been termed the ‘camps system’ have been analysed separately. This approach helped to pinpoint how they have combined to produce a hegemonic perspective on Romani issues, which yields a simplistic binary interpretation of a complex and dynamic phenomenon: Romanies are generally viewed as either victims or threats, narrowing the range of responses to charity or hostility. On March 26th George Soros, founder and chairman of the Open Society Foundations, and Thorbjørn Jagland, secretary-general of the Council of Europe published a co-authored article entitled ‘Why we are setting up a European Roma Institute’ (Soros and Jagland, 2015). Between political subjects and artistic performers: Will the European Roma Institute really help Europe’s Roma? It might have appeared a bit like a Hollywood drama about the rich and powerful pulling the strings behind the scenes, except that the topic was, supposedly, how to empower Europe’s weakest and most marginalised nation – the Roma. Over the past year negotiations have been taking place between the Council of Europe and a small group of activists who claimed the title “Roma elite”. Backed by the Open Society Foundations (OSF), the formidable civil society enterprise led by billionaire philanthropist George Soros, the group drew up plans for a European Roma Institute (ERI). It would, they said, “license” research on Romani culture and ensure that the dissemination of information on Europe’s largest ethnic minority would be “Roma-led”.